Flying Lotus collaborator Thundercat returns to Brainfeeder with his first full album since 2013's superb Apocalypse. Presented over four coloured pieces of 10" vinyl, Drunk is a thrill-a-minute, mix-tape style trip through the multi-instrumentalist and beat-maker's various inspirations (think skewed hip-hop, jazz, soul, funk, left-of-centre electronica, and so on), all of which have been fused and mutated to fit his unique musical perspective. 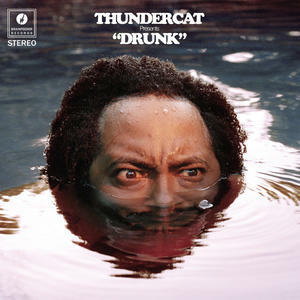 His high standing within the leffield hip-hop community has allowed Thundercat to snag some impressive guest stars, too, including Kendrick Lamarr, blue-eyed soul legend Michael McDonald, Kenny Loggins, Pharell and jazz man Kamasi Washington. Old pal "Fly-Lo" also lends a hand.